It’s the eleventh Day of Christmas and you may have noticed that most of my Twelve Days of reviews have been for memoirs. 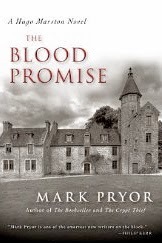 This will come as no surprise when you realise I am a very nosy person and love to read about other people’s lives, but today, in order to redress the balance a little I’ve four fiction novels to share: The Hugo Marston novels by Mark Pryor. 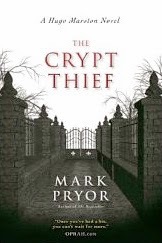 The Bookseller (A Hugo Marston Novel Series) The Crypt Thief and The Blood Promise are set in Paris and the prequel The Button Man is set in London and the Home Counties. 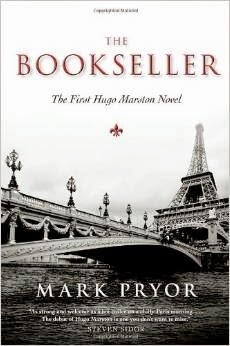 The Bookseller, the first Hugo Marston novel. Hugo has a soft spot for expensive books from the booksellers along the banks of the Seine and makes a friend of one of them, Max. When strange things and mysterious disappearances occur within the Bouquiniste community, no one is willing to talk and the police seem reluctant to look into it. Hugo seems to become involved by being in the wrong place at the wrong time, but with his FBI training and his friend missing he can’t just leave and walk away. Piece by piece and with the right help he slowly starts to understand what is going on, but not before more dead bodies start piling up around him. Will time run out before Hugo gets to the bottom of it? Bodies in a cemetery are not news, but when these are newly murdered bodies and bones from crypts around Paris are going missing, something needs investigating. As luck would have it the local police have the help of Hugo, as one of the victims is an American tourist. A friendship based on trust and respect forms between Hugo and Raul Garcia, the local police capitaine and they make a strong team along with Tom Green, Hugo’s friend from the CIA, that is sure to get to the bottom of the very dark mystery unfolding around them. Time is again of the essence, as the closer Hugo seems to get the more dramatic the situation becomes. The third novel in the series starts off a little differently than the others, in post-Revolution Paris when a dark secret is hidden in a compartment of a sailor’s chest. Two hundred years later, Hugo seems to have an easy assignment safeguarding a US senator who is in France on business. The situation soon spirals out of control when the senator disappears, a noble French family has it’s feathers ruffled and an old sailor’s chest seems to appear and disappear as often as the mysterious senator. The team are back, however and with Hugo, Tom and Raul answers will be found no matter who is trying to keep quiet. Like the other books this one is not without it’s body count by the time the mystery is solved. There are many plot twists, lots of mysterious happenings and of course Paris in the first three novels and I especially loved the humour and rapport between Hugo and his secretary and his mate Tom, who pops up in more than one novel to offer him unofficial backup. These books were something a bit different from my usual reads and I thoroughly enjoyed them, being entertained and gripped by the plots in equal measure. Paris never disappoints as a location and if you are looking for something a bit different to new life in Paris memoirs, or chick-lit romance in Paris then do give Hugo a try. This is the forth book to be released, but is a prequel with events taking place in the UK prior to Hugo’s posting to Paris, although Paris does make a brief appearance too. An American movie star couple hit the headlines when their reckless driving kills a local landowner in rural England. We have more disappearances, more bodies and more suspicious circumstances, as well as an elite club Hugo is desperate to gain access to. The killer is clever, but again piece by piece Hugo puts the puzzle together just in time. The Hugo Marston books are published by Seventh Street Books and available in paperback and ebook format. Links to Amazon are below.